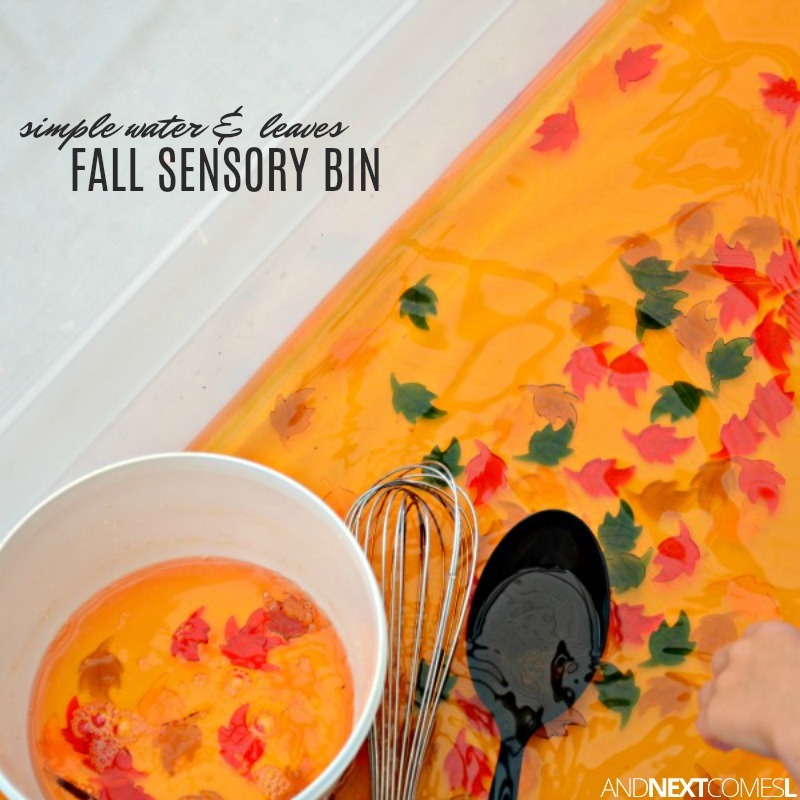 This fall sensory bin for kids is gorgeous, but super simple to put together. It's a great fine motor activity too! There are so many things that I love about the upcoming season change, but perhaps my most favorite thing about fall is the colors. Hues of red, orange, yellow, and brown mix with what is left of the green leaves. There's just something so magical about it, don't you think? So to capture the spirit of fall in a sensory bin, I put together this fall sensory bin for kids. It's quick and simple to put together, encourages fine motor practice, and is a great reflection of the swirling, colorful leaves of fall. 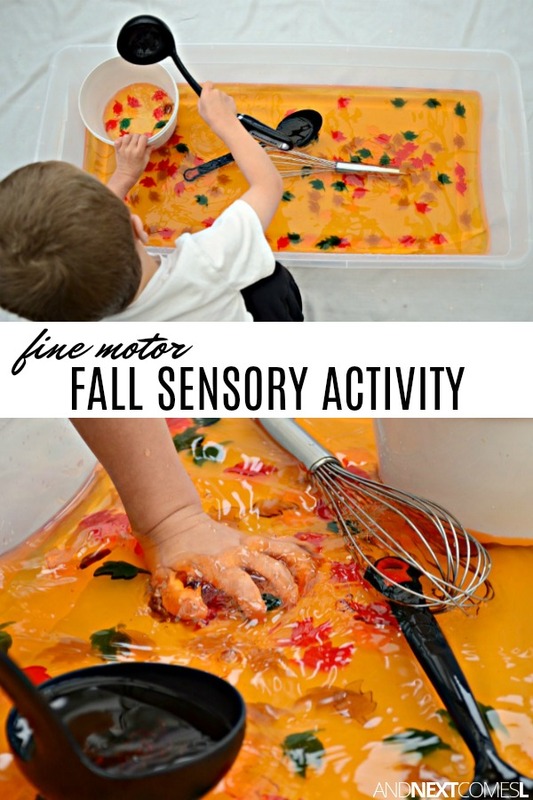 It's just one of 25 awesome fall sensory bins for kids. Liquid watercolors - I used a mixture of orange and yellow to achieve the golden color. You could also use food coloring to tint the water. Acrylic leaves - Mine are from Michaels and Target. Kitchen utensils - I added a whisk, a ladle, a large spoon, and a large plastic bowl, but other things to add are measuring cups, measuring spoons, etc. Then it's time to play! K was having one of his rare nap days, so J enjoyed this sensory bin all by himself. He had a blast scooping up the water and the leaves into the bowl. Once all the leaves were successfully transferred to the plastic bowl, J happily mixed his soup together using the whisk. He loved to whisk slowly and gradually increase his speed. Then he would happily tip the bowl, dumping all the leaves out and start the process all over again. J had so much fun with this fall sensory soup that we may have done many more sensory soups afterwards, but I'm going to have to share those another day. This is such a lovely way to offer sensory play! And since we have a lack of fall colors here in Southern California, I think we may need to add this to our weekly activities :-) Pinning. I can't imagine fall without fall colors! Thanks for pinning!